a recent digital publishing workflow required the creation of over 90 folders (one for each chapter of the book) and each of these also had to include a ‘links’ folder. imagine trying to do that manually — over 90 folders. this script shows one way to strip leading and trailing spaces from chunks of text. it uses two repeat while loops, each of which keep repeating for as long as the associated statement is true. the repeat loop ceases as soon as the statement is false, and the script moves on. 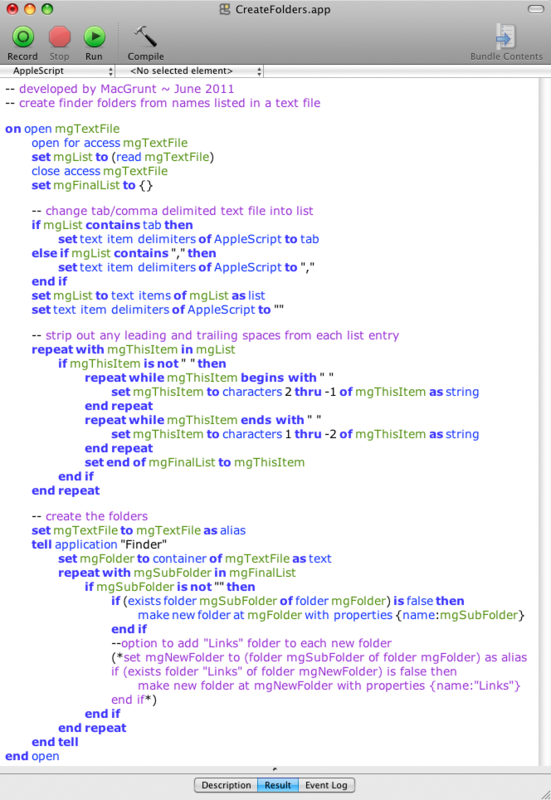 set text item delimiters of AppleScript to ","
set text item delimiters of AppleScript to ";"
This entry was posted in applescript, OS X and tagged applescript, finder, folders, how to, Mac, OS X, OSX, tutorial by macgrunt. Bookmark the permalink. This is going to be a godsend for me! I have an excel list of my clients and would like to create a folder for each of them. It would be very time consuming for me to create all of them manually. Would love to have the script and save a ton of time. Thanks a lot! I tried to post a comment and maybe I did but I can’t find it now. Anyhow, I’d like to try using this to create a whole bunch of folders for organizing my photos and if it works out, I’ll likely use it for my classes too later on. I’m in California (bit early for you, sorry) and just need to create individual folders from a long spreadsheet of members of a non-profit. Was hoping to figure out how to avoid doing it all manually, which I probably could have done by now, the time it’s taken me to find your neat solution (I hope). Wow….. i just did find your great work on this website! A Mac-addict since 1990, starting with a Classic1 with 9inch dislplay, end moved up to the Imac. Always searching for interesting stuff for trying on my dailly work at Prepress. Got a few scripts coming your way Kumpel. Nice to hear from another prepress dude. Worked great for me – thanks a lot! I work at an art collection and would like to generate a set of folders from an excel list of artist names in which to keep related documentation. No worries — sending this through now. More elegance, less repetition — it’s what it’s all about. What a great library you’ve got. I might hit you up later in the year if one of the kids ends up doing another carnival project. Flicking that app to you now. I love this idea! I am a teacher and am trying to create folders for all of my 160 students. This folder script would save me valuable time. Can I have a copy? This one seems to be popular with teachers. 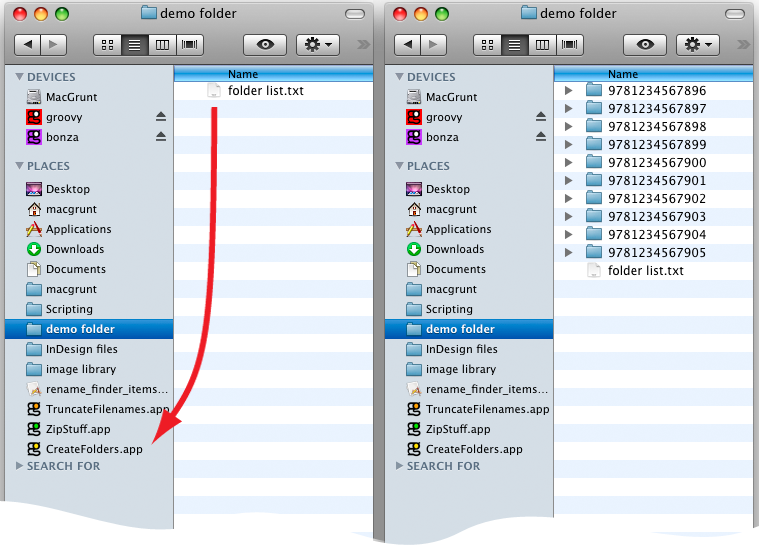 If possible I would like the CreateFolders.scpt to create folders from lists of items to be sorted on the Mac. Thanks. This is just what I needed!! Thank you for saving me from writing this one myself! Glad you found something useful here Arana. Thanks for the feedback — much appreciated. Hey Macgrunt! I loved this post!! So useful!!! Thanks for sharing this!!! Do you think it’s possible make one that would work with a .csv? for subfolders as well?